With school starting up this week, I decided we needed a way to display all of the paintings and projects that our 3 year old brings home from preschool. Now, we’ll have a place to proudly display her artwork (rather than leaving it on the kitchen counter or cluttering the fridge). It’s on the kitchen wall so this will give us a chance to talk about it each night at dinner. 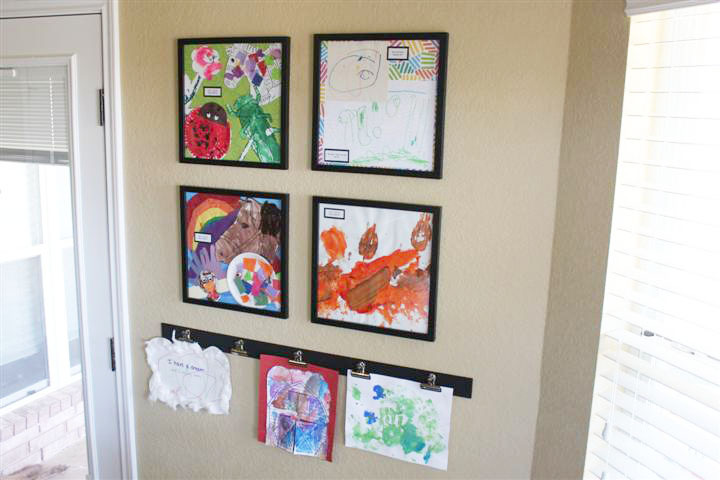 Right above the art clips, I have framed a few of our favorites from the last 2 years of preschool. I store all of the artwork and projects that come home in a box until the end of the year. In the summer, we go through the box and pick our favorites. I take our top 4 or 5 favorites and arrange them into a 12×12 frame and label them with her name and date. Then, I photograph all the rest for the digital scrapbook or to use them as teacher thank you notes (see my teacher thank you note idea here). Finally, I toss the artwork that doesn’t make the frame. 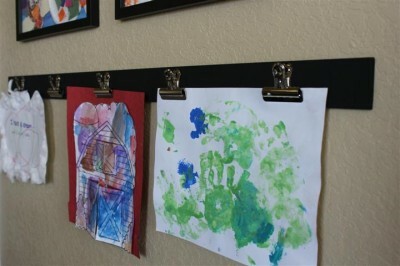 This helps reduce clutter around the house while still appreciating every piece of art that our kids make! I love the binder clips on a strip! What a clever way to change out artwork any time you want. Your “gallery” turned out beautifully!! This is brilliant and it looks fantastic! 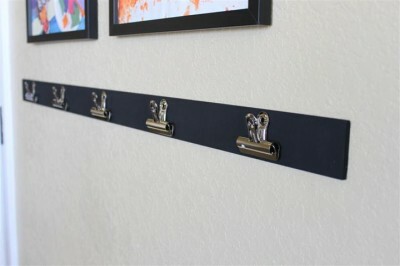 I love the favorites in the frames, but the clips on the wood strip are such a great idea! I used to be a preschool and kindergarten teacher, and I would have really appreciated a thank you note like that!! You will love having a vinyl privacy screen on your garage window! It really does go pretty fast and you will be surprised and the privacy. I thought that you would still be able to see in easily, but that is not the case. You eye looks at the design instead of what is inside. I guess it also helps that the areas to look in are pretty small. I think small circles would look great on an arched window. Ovals, oh, maybe octagons? Good thing I have some other windows I can do this with:) My mom said I could just cit opaque contact paper and put on, by I really like the look of the diamonds. I can’t wait until it is closer to Halloween so I can replace a few of the white diamonds with black and orange ones. Thanks for the great ideas. I’m looking forward to giving it a shot! I’ll let you know when I do. Awesome! My youngest is starting kindergarten (not sure if they do art in a half-day class yet…), and I’m sure we’ll be getting these masterpieces soon enough. Super idea. I love the idea of taking pictures of their work and using them as thank you notes!! I will be stealing that 😉 Thanks again for linking up! Really appreciate you linking up this awesome post at Creative Bloggers’ Party & Hop 🙂 Please continue sharing your creativity with us during the weekly party. I love this idea and can’t wait to do it in my son’s room. How did you attach the clips to the strip of wood? I used E6000 Craft Glue. It was much easier than trying to nail them to the board. They seem to be holding up just fine. Good luck! This is an awesome idea. So simple too! Thanks for sharing. Would love for you to share at http://www.thesasselife.com/2011/09/link-party-2.html. Hope to see you there!